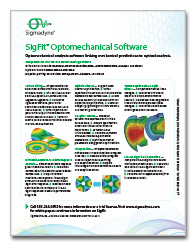 Results from SigFit may be graphically visualized within popular finite element post processors allowing users to view and publish graphical results with software already familiar to them. In addition, graphical results may be exported from SigFit directly in the form of PNG files. Figure 1: PNG plot created by SigFit pre/post-processing software. Figure 2: SigFit results plotted after import to FEA.